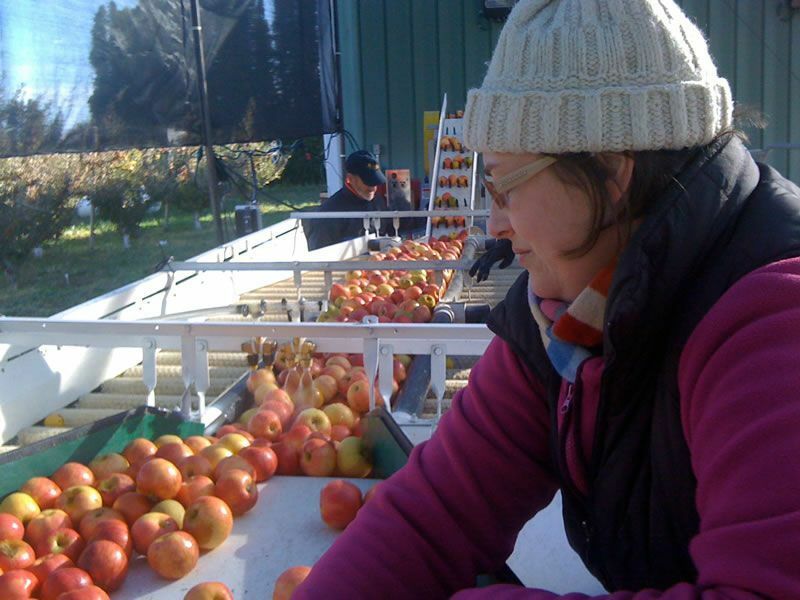 Heather Ringwood says cider’s popularity and limits on the availability of cider apples is an opportunity for local growers. Photo credit: Whitewood Cider. 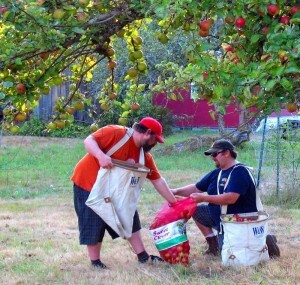 Dave White, a longtime blogger and craft cider judge and co-owner of Whitewood Cider, presses Olympia-area apples in the fall. Photo courtesy of Whitewood Cider Company. 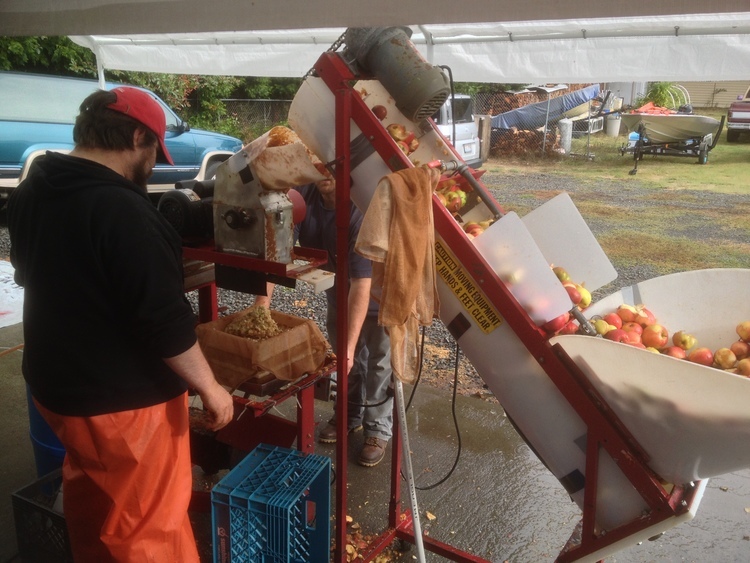 In the fall, Dave White and Heather Ringwood loaded the layers of their rack-and-cloth cider press with apples and squeezed out 1,100 gallons of juice, five gallons at a time. This month they debut their cidery, Whitewood Cider Company, with the release of their first blends. Whitewood is Washington’s newest craft cidery and the only one between Portland and Seattle. Because the flavors of the fruit mellow during the fermentation process, cider is best made from bittersweet and bittersharp apple varieties that have been propagated for several hundred years specifically for cider making. 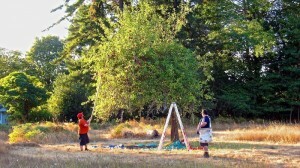 That doesn’t keep him from sampling apples from old trees in friends’ backyards, however. In fact, White, who’s been making cider since 2000, says he can taste in one or two bitter bites how an apple’s juice will mellow into the finished product. They gleaned about 4,000 pounds of unidentified apples from trees around Olympia, enough to press into roughly 300 gallons of juice. The result is a blend made exclusively from Olympia apples. The remaining three blends are crafted from apples they purchased, including ten bins of cider apples from Eastern Washington and some familiar heirloom varieties such as Gravenstein, Jonathan and McIntosh. Craft cider is enjoying a domestic renaissance that was starting to blink awake about thirteen years ago, when White first tried a San Juan Island cider blend and started making the beverage himself. In 2007 he started one of the first cider blogs in the nation, Old Time Cider, and took a course in cider making at the Mt. Vernon Agricultural Extension the following year. The blog led to interviews and to invitations to judge cider competitions around the country. White was also one of the founding members of the Northwest Cider Association. All of this has landed him in the center of a geyser of enthusiasm for the drink. Asked why it’s the new darling of the alcoholic beverage industry – cider is said to be its fastest growing segment – White rattles off a handful of reasons. Cider is riding the tails of the public’s interest in winemaking and artisanal beers that has led to a growing curiosity about new alcoholic drinks. Small batch fermentation dovetails with the locavore movement, with more people searching for consumable products produced close to home (a fact which makes the apple-rich Northwest a bright spot in the drink’s future). Cider has a complexity that mirrors wine but with a lower alcohol content (wine averages 12%; cider and beer, 6-8%). Not only do fans of the drink say it’s light and refreshing but cider is also gluten free, a serendipity White says he couldn’t have anticipated. Cider’s popularity is, in fact, outgrowing apple production. Producers don’t tend to have their own orchards, so the demand for cider apples is stretching local availability. The situation is creating an apple crisis of sorts but one White and Ringwood say the industry will – literally – outgrow. “There’s a real opportunity for local growers to set aside two or three acres and grow cider apples,” Ringwood says. Even with limits on apples, the industry as a whole is communal and supportive of their own. One of White’s recent blog posts chronicles his trip to another regional cidery where he joined a number of friends to help transplant an orchard, relocating it after a Mount Vernon cidery shuttered its operations last year. Though cider isn’t meant to be cellared, the process of producing it is more akin to the subtleties of winemaking than beer production, says Ringwood. Like wine blends, ciders can be spicy, light, sweet, heavy – it all depends on the character of the fruit. These wide-ranging flavor profiles chip away at the notion that hard cider is the syrupy cousin of beer, down on the bottom shelf of the cooler. Experienced cider makers choose their fruits for specific qualities and blend them to achieve a balanced flavor. They experiment with yeasts and make judgment calls on whether to filter their ciders or not (Whitewood’s are unfiltered) and whether and how much to carbonate (White and Ringwood both prefer a little sparkle). After that, the choice is up to consumers. Those interested in trying Whitewood Cider Company’s limited blends, who aren’t already CSA subscribers, will be able to throw back a few samples at the public kick-off party at the Eastside Club Tavern. Watch the Whitewood Facebook page and Twitter feed for details.